There is no one implant type or implant placement that is best for everyone. Since each woman has her own unique body type, proportions, and cosmetic goals, plastic surgeon Andrew Cohen, MD will explain all of your options in detail during the consultation process. After learning about the differences between silicone and saline implants, as well as the advantages of the various implant placement techniques, you can come to an educated decision about your breast augmentation surgery. To help you in your decision-making process, Vectra® 3D Imaging technology creates a digital rendering of your body and allows you to virtually “try on” implants of varying sizes and shapes. After discussing his own recommendations about your implant choice based upon his experience, Dr. Cohen will then design a custom-tailored surgical approach, taking into account your personal expectations and desires. Saline implants are composed of a silicone shell that is then filled with saline solution to your desired size. Since the implant is inserted into the chest before it is filled, saline implants can offer the opportunity to completely customize the final size of the breast. As an added advantage, if a saline implant ruptures, the rupture is immediately evident and can be addressed quickly. Saline implants can also provide a more economic means of breast augmentation. Silicone implants are FDA-approved for women who are 22 years of age or older. 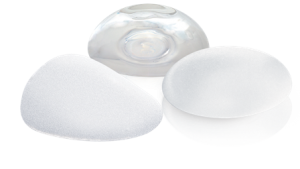 These implants are filled with a form-stable silicone gel and typically look and feel more like natural breasts. Silicone implant ruptures may not be immediately evident, as the gel tends to seep out of its shell quite slowly. As a result, the FDA recommends women with silicone implants have an MRI performed every two to three years to ensure the implants have remained intact. If a rupture has occurred, then the implant can quickly be exchanged. When selecting an implant size, patients wear a garment that accommodates a series of interchangeable sizers to help them make a decision. Coupled with the visual simulations produced by the Vectra® 3D imaging technology, these sizers can give you an idea of how various sizes may look after augmentation. Our plastic surgeon can help you decide which size and type might both meet your aesthetic goals as well as look natural and proportionate with your unique figure. Implants can also be smooth or textured, shaped or round. Dr. Cohen will explain during the consultation the advantages and disadvantages of each implant type and help you come to an informed decision. In addition, a physical examination will also be used to determine whether your body can safely accommodate your desired implant size and type. Over or Under the Pectoral Muscle? Implant placement can also significantly impact the final results of your breast augmentation. Your implant choice, the thickness of the breast skin, and the shape and volume of pre-existing breast tissue will factor into Dr. Cohen’s recommendation for your implant location. Over the Muscle: For patients with more breast tissue or stretched skin around the breast, placement over the muscle can produce the best results. Placing an implant above the muscle can create a rounder breast and also reduce the duration of recovery. Under the Muscle: For patients with thin skin around the breast, placement under the muscle tends to produce the best results. Placing an implant below the muscle can create a more natural slope to the breast as well as reduce the risk for capsular contracture. After your physical examination and a discussion of your individual aesthetic goals, Dr. Cohen can help you decide which incision type can best meet your needs and expectations. The incisions used to place silicone implants tend to be slightly larger than saline implants, as saline implants are filled to the desired volume after they are placed in the breast pocket. The decision to combine your breast augmentation with a breast lift may impact which incision type Dr. Cohen recommends. The type of incision used for your breast augmentation will also take into account the implant placement and location. Regardless of which incision type is used, Dr. Cohen makes every effort to conceal the resulting scar along the border of the areola, along the lower fold of the breast, or hidden in the underarm area. After the healing process is complete, many patients find that the scars are extremely inconspicuous, even when wearing a bra or bikini top. To learn more about your breast implant choices, or to schedule a consultation, please contact us today.